Have you seen or heard about Kwikmoney that has made personal banking in Nigeria attractive and convenient offering quick short-term loans to individuals to meet their urgent needs. With Kwikmoney all your worries are over especially when you need little money to take care of your personal problems, You will get it fast and direct to any bank account in Nigeria. Yes, you heard me right, I am saying it from experience I have been using their services for a while now and I will show you the proof that it really works. 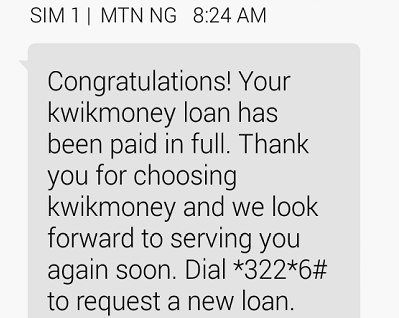 The first time I heard about Kwikmoney was when I tried Quickteller Loan not knowing that they are in partnership with them but now you can simply visit https://www.kwikmoney.com/ for your quick loan request or read about Quickteller loan here. Kwikmoney is a platform designed to enhance personal banking in Nigeria, in partnership with banks, mobile network operators, and technology companies offering individuals quick short term loans that don't require any collateral or paperwork to get. no phone calls and no question asked. Whether you need working capital for your small business or need to handle a family emergency, kwikmoney lets you get an instant loan of up to N500,000 direct to your bank account. Typically the loan tenor is 14-30 days, with an interest rate between 5% and 15%. As you take loans and pay back, the system trusts you more, offering you higher amounts each time. No collateral, no documentation, no wahala. Apart from loan offer, Kwikmoney also has Instant Savings plan, an opportunity for investors wishing to save and earn money through their platform. I have gotten a loan from them not once or twice but on a regular basis and I know exactly how it works, as a first timer you might need to start from little and allow the system to trust you before you can request big amount. Firstly, you need to visit https://www.kwikmoney.com/ or dial *561# if you need a loan and follow the instructions, if you visit the website you will need to add your phone number and click GO. Another good news is that you can still get an instant loan even when you don't have internet enabled smartphone or computer, all you need to do is to dial *561# and follow the instructions but it might be more convenient to use a Laptop or smartphone if you have but if you don't go ahead and use the USSD code. To get started you only need to visit kwikmoney website, enter your phone number and you will be taken to another page where you will see the option to check loan offers available to you, choose from the list and you will receive your money in any bank of your choice simple. Just like I said earlier, Kwikmoney offer a short term loan and not long time loan and when you borrow from them will be required to pay back within 14 days or 30 days. However, before requesting for a loan the first question to be asked is the interest rate and if you are asking the same right now then the answer is simple, You will pay 15% of any amount you borrow, though the interest might come down to 5% when the system trusts you. 15% Interest rate means that when you request for N4000 loan then you must pay back N4600 in 14 days, the extra N600 is the 15% interest. If you wish to verify few things about Kwikmoney then the door is open, you can contact them through online chatting from their website, email address and customer care phone numbers. If you still have any question, don't hesitate to ask and receive a prompt response.